Putin said it was a "dignified and convincing victory"
ULYANOVSK, October 10. /TASS/. Russian President Vladimir Putin has extended his congratulations to fighter Khabib Nurmagomedov for winning the UFC (Ultimate Fighting Championship) champion’s belt last week in the United States. "My sincere congratulations to you," Putin told Nurmagomedov as they met on Wednesday evening in the Russian city of Ulyanovsk within the frames of the "Russia - Sports Power" annual forum. 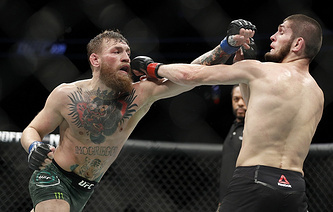 Nurmagomedov defeated Ireland’s Conor McGregor during the Ultimate Fighting Championship (UFC) 229 tournament in Las Vegas on Saturday, defending his lightweight title. 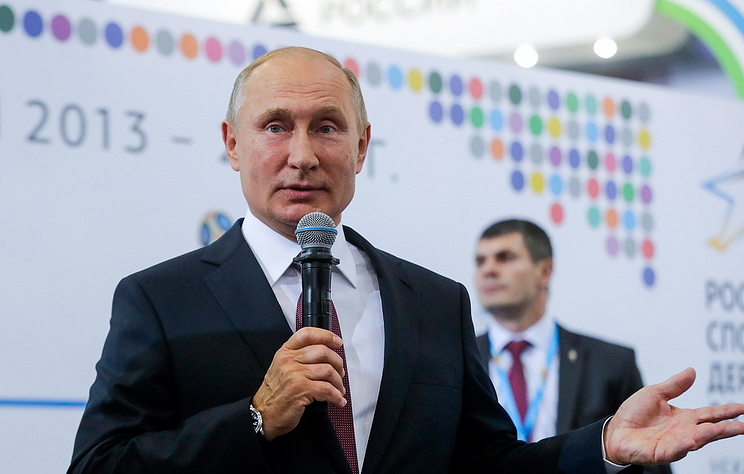 "You have reached the main task enjoying a dignified and convincing victory," Putin said adding that sports achievements should be rated higher in comparison with financial bonuses. 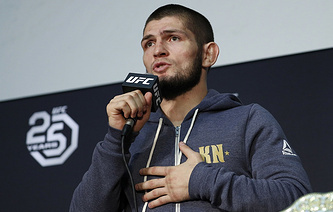 "I would like to voice my hope that the ideals of sport will be above everything - above bonuses and advertising," he said addressing Nurmagomedov. "First of all, I mean the team and your opponents. Ways should be opened for normal conversations, men’s friendship as well as sports friendship. Sport serves these purposes." After the fight in Las Vegas on Saturday, a mass brawl broke out between the teams of both fighters, including Nurmagomedov, who jumped out of the cage and attempted to beat up one of the Irish opponent’s team members for insulting him. UFC President Dana White earlier said Nurmagomedov could be stripped of his lightweight title in the event of a lengthy suspension. On Sunday, Nurmagomedov apologized for his behavior after the fight at a news conference: "I want to say [I’m] sorry to [the] Athletic Commission [in] Nevada, [I’m] sorry to Vegas…I know this is not my best side, you know this is not my best side, you know I’m a human being. And I [don’t] understand how people can talk about [why] I jumped [over] the cage. What about [how] he talked about my religion, he talked about my country, he talked about my father… This is a respect[ful] sport, this is not a trash-talking sport… like I told you before guys... I want to change this game." The victory over McGregor was the 11th in Nurmagomedov’s career in the UFC. The Russian defeated his opponents in all of his 27 fights. The 30-year-old Nurmagomedov, hailing from Russia’s North Caucasus Region of Dagestan, was the first Russian to win the UFC champion title during the fight against his US opponent Al Iaquinta this April. On April 8, Nurmagomedov defeated his US opponent Al Iaquinta in a five-round fight for the Ultimate Fighting Championship (UFC) lightweight belt in New York. Nurmagomedov became the first Russian to be awarded the UFC champion title. The 29-year-old Russian clinched the 26th victory in his career with no defeats, while Al Iaquinta suffered his fourth defeat with 13 victories and one draw.